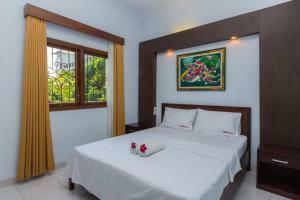 RedDoorz @ Pendawa Kuta - Kuta, Bali, Indonesia - Great discounted rates! 8.0 out of 10 based on 19 verified user reviews via Agoda. Ideally located in the prime touristic area of Kuta, RedDoorz @ Pendawa Kuta promises a relaxing and wonderful visit. Both business travelers and tourists can enjoy the hotel's facilities and services. Free Wi-Fi in all rooms, car park, airport transfer, safety deposit boxes, smoking area are there for guest's enjoyment. Television LCD plasma screen, internet access ?ÛÒ wireless (complimentary), non smoking rooms, air conditioning, balcony terrace can be found in selected guestrooms. The hotel offers various recreational opportunities. For reliable service and professional staff, RedDoorz @ Pendawa Kuta caters to your needs. RedDoorz @ Pendawa Kuta - Bali classifies itself as a 2 star hotel.